The only reason I go to coffee shops is that they offer a wide variety of drinks I can try! I don’t have to stick to the standard cup of joe I have every day. But, the problem with coffee shops is that you cannot have much control over what you’re brewing. And, for someone like me, that control is everything. And, that’s exactly the reason why I love Ninja Coffee Bar. This single machine has never failed at making me satisfied with the quality of coffee and versatility. Be it espresso, classic or something speciality, I love a Ninja coffee bar. In short, it’s the coffee-house replacement for your home. However, not all Ninja coffee bars are made the same. You wouldn’t need the highest-priced machine if you drink just two cups a day. If you’re someone like me, don’t even think of settling with the base-line models. In this article, however, we have covered the best Ninja coffee bars out there. We have found, analyzed and reviewed the best Ninja coffee bars you can find in the market today. It doesn’t matter how much you can spend, you’ll find an option here. 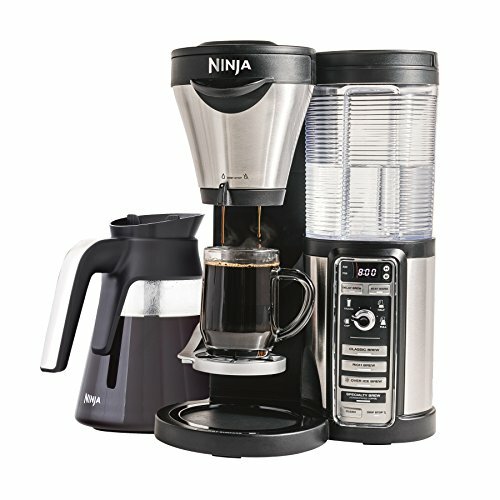 If you need a complete coffee-maker package from Ninja, you should go for Ninja Coffee Bar CF097. It’s been packed with so many features such as the in-built frother, stainless carafe and five different brew options. If you ask me, it can get me almost any type of drink I want. You can also choose between custom brewing and signature brews. For me, the perfect cup of coffee doesn’t compromise flavor. Ninja Coffee Bar CF097 manages to extract the sole flavor of the ground beans — every single time. Flexibility is another area that we loved. You have the complete control over brewing method, brew size and how your coffee turns out. I also loved the Intelligent control panel, which makes selections easier. Ninja Coffee Bar CF097 is also suitable for those who need coffee in a single click. We cannot skip the Café Forte while talking about this Ninja bar, you know. It’s so awesome that you can feel every bit of the coffee. In case you are new to Ninja products, you would also love the recipe book that’s in the package. And, last but not least, it’s very easy to descale this machine. Looking for the best cup of coffee every single time? Go for Ninja Coffee Bar CF097 without a doubt. I know that you are looking for an affordable Ninja coffee bar that doesn’t let you down. You can count on Ninja Coffee Bar CF091 in this matter. Compared to other products from Ninja, this product is quite compact. If you have a small kitchen area and want awesome drinks every day, you can count on this product. Don’t let the compactness fool you, though. 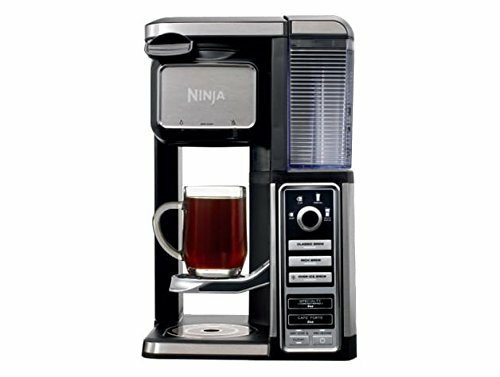 Ninja Coffee Bar CF091 is so powerful that it can brew up to 10 cups of coffee at a time. It means big families and offices are going to love this thing. Like our top pick, it offers five brew types, including Café Forte. You’d be able to choose between six brewing sizes as well. Of course, you are compromising something in the area of control, though. One feature you’d miss here is Programmable Delay Brew. But, let us remind ourselves that we are saving a lot of money here. For whatever that we’re paying, Ninja Coffee Bar CF091 is offering the smoothest brewing experience you can imagine. And, you will be saving a lot of money, which would otherwise be spent to buy pods. Looking for the best coffee without spending much? Go for Ninja Coffee Bar CF091 without a doubt. #3 Ninja Coffee Bar CF112 Budget Pick! Probably, you don’t need bigger brew sizes or a lot of features. Instead, you need a superb Ninja coffee bar with single-serve. Ninja Coffee Bar CF112 is there for you, folks. This little beast lets you choose from 5 brew styles for your perfect cup. And, yes, you’re getting Café Forte — say hello, coffee addicts. Coming to brewing sizes, there are four. You don’t have to disappoint your friends or family because you have a single-serve machine. You can always turn the Carafe Mode for more coffee. One thing you’re missing is the carafe. Unlike other models, it doesn’t have a thermal carafe to hold your coffee. If you ask me, the best part about the machine lies with the level of control you’re getting. As far as brewing goes, there is so much quality that you can compare Ninja Coffee Bar CF112 with a smaller Starbucks. Just so you know, one of these Ninja coffee bars was the reason why I reduced my visits to those expensive Starbucks stores. When you are getting so many features, in-built frothing and a simple design in a single package, why would you need Starbucks? If you are looking for a superb, single-serve Ninja coffee bar, go for Ninja Coffee Bar CF112. Ninja Coffee Bar CF080Z is yet another fully-fledged Ninja coffee bar you can buy right now. It has been built for the sake of simplicity if you ask me. The One-touch iQ Intelligence is something we really loved it here. It makes the whole brewing process easier than ever. At the same time, the bar offers control over how the cup is brewed too. You can choose between three types of brews in the game. One thing you’d be missing is Café Forte. If you’re a big fan of the intense cup of coffee from Ninja, Ninja Coffee Bar CF080Z isn’t for you. However, the delay brew feature and automated systems make the machine worth the while. You can also experiment with the Specialty brews available in the package. Compared to other Ninja coffee bars we’ve tried out, Ninja Coffee Bar CF080Z is quite easy to manage. From filling water to getting the cup of an espresso shot, everything seems so smooth. Also, you’re getting the very standard frother, which isn’t a big deal. On the bright side of things, the thermal carafe with warming plate does a great job. If you are looking for a simple yet effective Ninja coffee bar, Ninja Coffee Bar CF080Z sounds great. 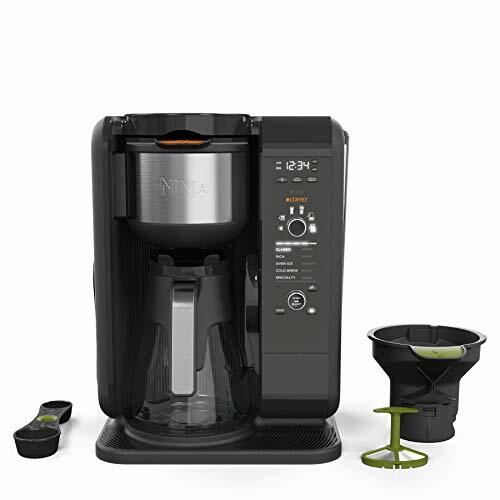 Ninja Coffee Bar CP301 is probably the most compact Ninja coffee bar you can find right now. Even with an incredibly compact design, the machine packs so many features such as programmable brewing and support for up to six brewing sizes. And, although you are missing out the legendary Café Forte, you can brew a huge variety of drinks using the system. There are some smart features in the package too. For instance, it has a superb glass carafe that keeps your coffee at the best temperature. Unlike some of the compact products above, Ninja Coffee Bar CP301 offers bigger brewing sizes as well. You wouldn’t have to repeat-brew just because you have a few friends at your home. If you ask me, Ninja Coffee Bar CP301 can be called the smaller Starbucks for most people. It does not offer much control, per se. Nevertheless, you can have the same quality of drink for a long period of time. You are also getting an in-built frother for this package, which is quite affordable. However, this is my favourite choice for brewing cold beverages. 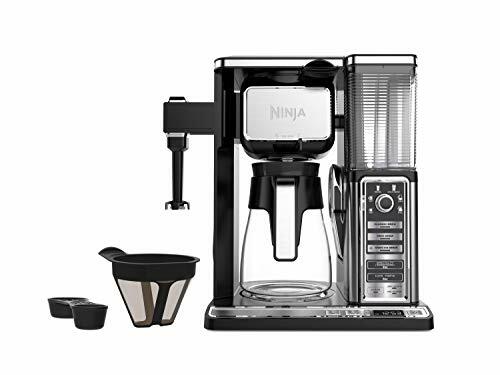 We’d recommend this Ninja coffee bar for those who need a quick yet impressive beverage-brewing deal. Now that you have seen some of the awesome Ninja coffee bars available in the market, we’ve made a brief guide on how to choose the best Ninja coffee bars. Let’s start with the basics. What is a Ninja Coffee bar? Ninja Coffee Bar is the name given to a particular type of coffee machine that is manufactured and marketed by SharkNinja Operating LLC. These devices are expected to bring a coffee-shop-like experience to a kitchen or someplace small. It means that you can brew a wide variety of beverages using the single machine. There are a few other factors too. First of all, when you have a Ninja coffee bar, you don’t need four individual devices. 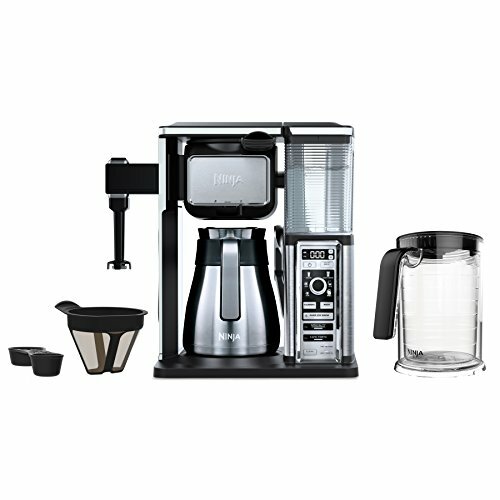 Normally, you will need a machine for brew coffee, one for espresso and another one for cold beverages. Ninja coffee bars, on the other hand, have been optimized for everything. Depending on your selection, it can provide you with a big variety of drinks. Classic Brew gives you the standard cup of coffee that you used to have from the drip machine. Rich Brew is the best if you want the coffee to be dairy-rich. You don’t have to worry about additional flavors being present in the coffee. Instead, Ninja coffee bars keep the perfect ratio. Iced Brew, as the name says, is for making cold beverages according to your choice. It does not really matter whether you’re into iced tea or iced coffee, they get the job done. Specialty Brew is your deal if you want espresso-based drinks from the machine. Here too, you have complete control over the brewing process and even find the middle-flavor between cappuccino and latte. Café Forte: You cannot find this option in all Ninja coffee bars. When you have, you get the perfect blend quality of the grounds you are using. It’s one of the legendary features in Ninja coffee bars that you would surely love. As we said, there are Ninja coffee bars that don’t have all these brewing options. I, for one, find the four-set brewing options quite useful. If you have control over brewing, the pre-set options don’t really matter. What Things to Consider Before Buying a Ninja? So, we have listed some of the best Ninja coffee bars in the list above. That having said, you will have to take a look at the following factors before you buy a product. We’ll be quick; don’t worry. Coffee Intake: You should consider the maximum brewing capacity of the Ninja coffee bar. If you’re a big family with a lot of coffee intake, it’s better to have a multi-serve Ninja bar. On the other hand, a single-serve machine would be enough for the simple coffee lovers out there. Budget: Of course, not everyone can spend thousands of dollars on a coffee machine. Thankfully, the Ninja coffee bar machines are available at all budgets. You should consider the price tag before you jump in. Design: Depending on your space, you should consider the design of the machine too. If you have a bigger kitchen, anything big would suffice. On the other hand, if you are getting the coffee bar for an office, we’d recommend something so compact. Maintenance also plays a major role in decision-making, you know. The coffee bar must be easy-to-clean and maintain. Descaling is the tough-job here, remember. So, ultimately, you want different types of coffee without having dedicated machines. In that case, you can choose any of the Ninja coffee bars we’ve listed above. However, don’t get a single-serve machine and complain about low brewing capacity. Also, if you need more creaminess to the drinks, go, get one with a frother. Choose the best Ninja coffee bars for you, from the best we’ve chosen for you. If you are looking for Ninja Coffee Bars then check out our ninja coffee bar reviews. It doesn’t matter how much you can spend, you’ll find an option here.